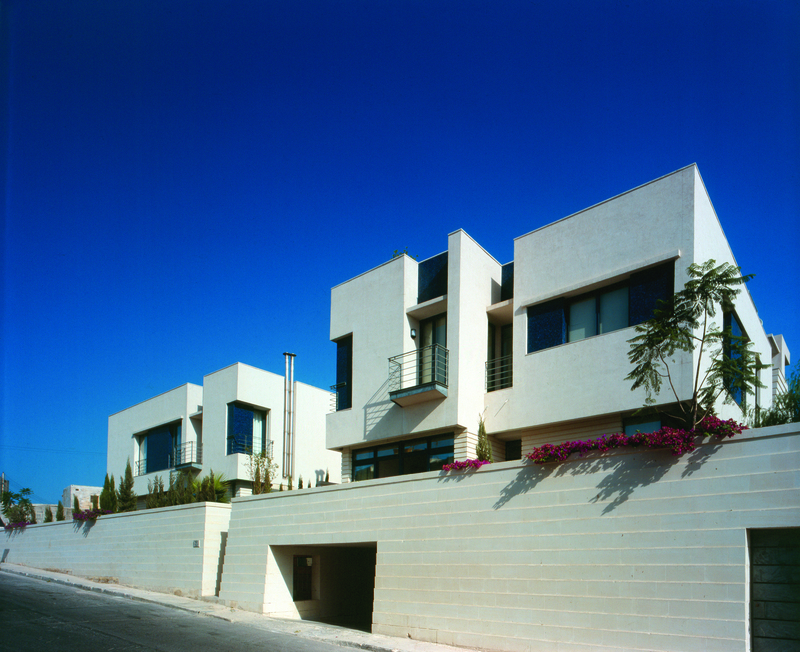 L. Farrugia and Sons ltd.
Four residences clustered together to form a court at the heart of this residential development. The cue taken from the Mediterranean ‘ortus clausus’ was extended to the built fabric itself, which occupies the site in such a way, that the balance of solid and void, public and private, light and shade finds a natural equilibrium. This ensures that the visual quality of the spaces is homogeneous and interconnected, outside and inside mingles without losing their definition, and the sculptural effect of the buildings is enhanced. The latter was achieved by reinterpreting the stringent local building regulations regarding heights, shaft sizes etc. 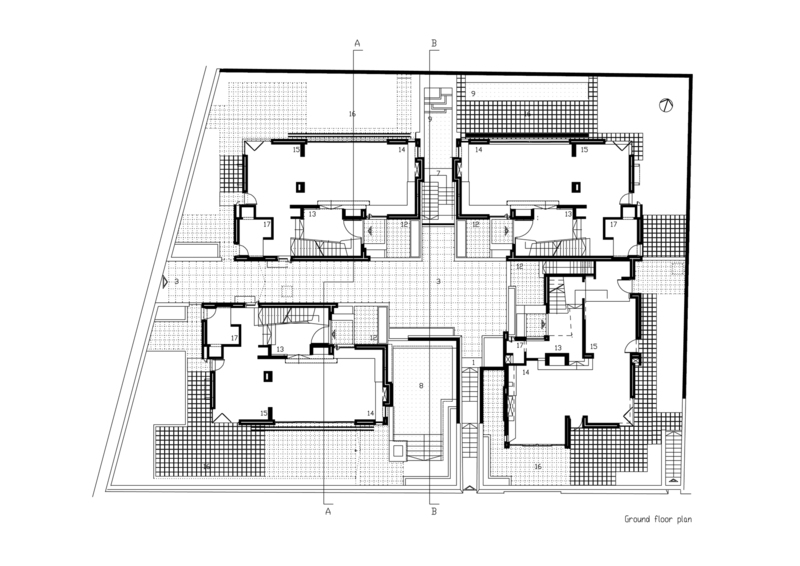 in such a way as to create vertical visual interest by means of a complex play of double heights and spaces. These interiors are reflected on the outside by a ‘De Stijl-like’ composition of materials: the traditional stonework rubbing shoulders with blue glass mosaic tiles, plaster walls setting off the raw deal ventilation panels. The raised ground floor that shelters the underlying car park is fully landscaped, this level having been rid of the necessity of drive in and car ports. 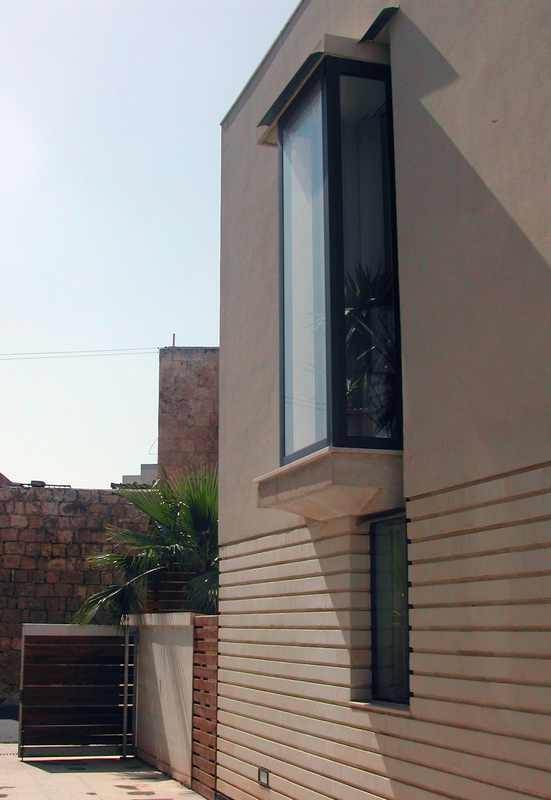 The ground floor of each residence is as a result designed with large areas of glazing shaded by considerable overhangs, as extensions of the central court. The whole building elevates itself above the suburban sprawl that surrounds it to catch glimpses of the views to the sea that are the main component of the roof terraces. 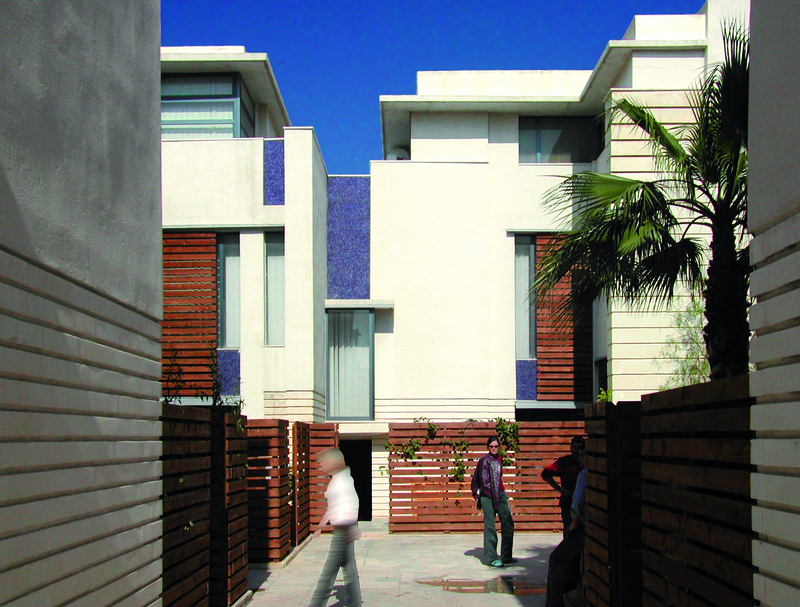 From a climatic point of view, the juxtaposition of open and closed spaces is designed such that the reservoir of cool air that accumulates in the sheltered central court, is distributed throughout the four residences, through slatted wooden openings inspired by traditional louvers, and rises unobstructed through the several vertical voids in the houses themselves. The interiors are based on the same three dimensional and planar principles at the base of the architectural concept of the building, and are as restrained as possible in preparation for the specific requirements of the new residents.